The University of Sheffield has announced another multimillion pound project for the AMRC 2 campus on the Sheffield Business Park. Located on the Advanced Manufacturing Park (AMP) in Rotherham and a partner in the HVM Catapult (the government's strategic initiative that aims to revitalise the manufacturing industry), the University's Advanced Manufacturing Research Centre (AMRC) with Boeing focuses on advanced machining and materials research for aerospace and other high-value manufacturing sectors. It is a partnership between industry and academia, which has become a model for research centres worldwide. Today, the Business Secretary Sajid Javid announced a new £4m investment from the Engineering and Physical Sciences Research Council (EPSRC) that will enable the university to build one of the largest dynamic test facilities in the UK. The £11m Structural Dynamics Laboratory for Verification and Validation will be unique in its research and development offer to businesses across the UK. It will drive forward collaborative research with industry and cement the Sheffield city regions's position as a world leader in structural dynamics. A modular environmental chamber in the laboratory will be able to control temperature, humidity and wind speed as well as simulate rain and snow. The ability to test in realistic conditions at full scale will pave the way for engineers to create lighter, greener, safer structures. The development has been widely endorsed by industry. Many leading companies, including Airbus and Rolls-Royce, have written letters of support for the new facility which will transform the opportunities to research in structural dynamics in the UK. Professor Richard Jones, Pro-Vice-Chancellor for Research and Innovation at the University of Sheffield, said: "Computer simulation of models of the way large structures behave in use are increasingly powerful, but for industry to realise the full benefits of these techniques we need to test these models against large scale experimental data, so they can be confident of their results. "This facility will allow us to do this testing, giving industry confidence in the models and allowing faster and therefore more cost effective product developments in a number of different industry sectors. "Better modelling also means we will be able to move from structures that have a safe-life design philosophy to a damage-tolerant one which offers cost savings through extending the lifetime of existing structures." Professor Keith Worden, head of the Dynamics Research Group (DRG) in the University's Department of Mechanical Engineering, added: "This new facility is extremely important for the University of Sheffield and will give the UK a world-lead in verification and validation research while accelerating new methods and test protocols. "Advances in structural dynamics hold the key to major cost reductions across many of the UK's priority industrial engineering sectors. "This facility will have the ability to test structures like helicopters and airframes at full-scale and will present the UK with a unique opportunity to take a world lead in verification and validation." 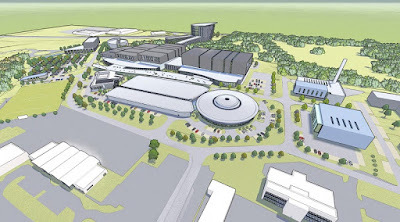 The masterplan for the AMRC 2 Campus includes new research buildings such as the proposed £30m National Material Institute, part of the Sir Henry Royce Institute for Advanced Material Science, announced in December. Anticipated projects also include a £20m Fast Make Centre of Excellence were prototypes move to manufacture within months, and a £30m Energy 2050 development - a world-leading hub of excellence set up to address the "trilemma" of making energy more affordable, secure and sustainable.